The Washington Times published my review of Cold War Navy SEAL. The Cold War, that period following World War II in 1947 until the fall of the Soviet Union in 1991, saw the attempted expansion of communism by the Soviet Union and other communist countries, and the attempted containment of communism by the U.S. and other Western democracies. As both the U.S. and the Soviet Union had nuclear weapons, all-out war was mostly out of the question, so proxy wars were fought with surrogates backed by the superpowers. Today, when one thinks of the Cold War, perhaps one thinks of the hot spots of the era, such as Berlin, Korea and Vietnam, but the Cold War was waged nearly all over the world, including Africa. As former Navy SEAL and CIA operator James M. Hawes notes in his book, “Cold War Navy SEAL: My Story of Che Guevara, War in the Congo, and the Communist Threat in Africa,” Africa was clearly on the Soviet Union and Communist China’s radar in 1965, and the Soviet Union’s client state, Communist Cuba, sent troops and renowned revolutionary Ernesto “Che” Guevara to the Congo to arm and train the Simba Rebels. The CIA sent a 26-year-old Navy SEAL. “This is a first-hand, ‘names and places’ account of what really happened inside a Cold War CIA program that’s been kept out of the history books. 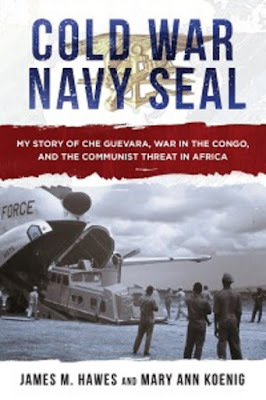 It’s the story of an American Navy SEAL who fought to aid a fledgling democracy in the Congo and stem the tide of communism in Africa,” writes “Cold War Navy SEAL” co-author Mary Ann Koenig in her introduction to the book.